and when the news about the VW manipulation of emissions data hit, it embarrassed me to drive around in my wonderful car. I had to work pretty hard to remind myself all the ways in which the car performs well for us still, and to recognize that we made the right choice with the knowledge we had at the time of our decision. The misrepresentation of the car’s greenness wasn’t our fault. It wasn’t our fault that there were greener options hitting the market after we bought, either. And it is a damn good car. Second, we seem to want to blame someone for poor performance or decisions on a project, as of this merits our inclusion in future work. Recently, at work, a colleague made disparaging comments about a lighting retrofit project in our main building, saying we should have replaced the overhead CFL tubes with LED instead of the new higher efficiency 23 watt CFLs, and the new diffusers looked cheap, and why didn’t we redesign the layout of the ceiling fixtures. So many explanations filtered through my head. With a cost incentive from National Grid our ROI was only 8 months and we are using significantly less energy, down about third in power for lighting. The diffusers more evenly distribute the light, for much better work-surface levels, and the design and replacement used a manufacturer/building services partnership for the least disruptive approach for the staff. We made excellent choices within the parameters of the knowledge and available tech of the time. I later realized this poor assessment of a past project reflected this colleague’s wish to be included AND showed his passion to do things right; however we need to make sure our perception of “perfect” does not became the enemy or the inadvertent underminer of admirable progress. 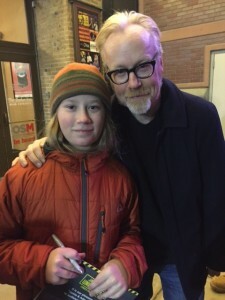 My son and I went to see “Jaime and Adam UNLEASHED” last week. 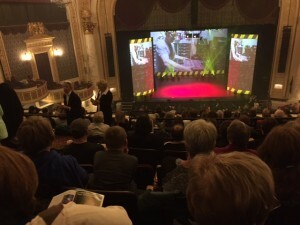 Any of you that is a fan of Mythbusters knows what a great evening this was. Trust me, this relates. The show was a mix of physics experiments writ large, QnA with the daring duo, comedic moments, audience participation, excellent stage craft and wonderful, engaging storytelling. It started off with Adam telling about his experiences in life/career leading up to a 14 year partnership with Jaime on Mythbusters. He painted a great picture of being mesmerized by Legos and Star Wars when a child and his passion for juggling while a teen and young adult. How he learned all the tricks he could in juggling, but then plateaued and couldn’t really get any further. He finally found one obscure book that said the “chop” was the move that differentiated the novice from the expert, so he set about learning the chop. And he figured it out…and it was true, there was a whole new aspect of juggling opened to him. At this point he shared this transforming lesson: he threw the juggling clubs up into the air and let them hit the ground and said “the sound of learning is that sound”. Never stop realizing that failure is the road to success, and never stop picking up the ideas or the items you’ve dropped so you can give them another try. This is the idea that we need to promulgate in the working world of sustainability. There is no perfection when we are learning so much new every day. There is no blame when we drop the juggling clubs. It is part of the learning progress. 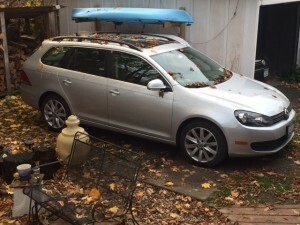 So let’s not see our lighting retrofit or the purchase of our Jetta as in any way a mistake, but let’s acknowledge the limits of the resources and opportunities of the time. Do we condemn such a project or choice? Absolutely not. We celebrate the effort, note the improvements and learn from the implementation. Do we bemoan that the project skimmed off the “low hanging fruit” and has left us with no incentive to do better work? No! Innovation and opportunities are changing and growing and we have so much to do! 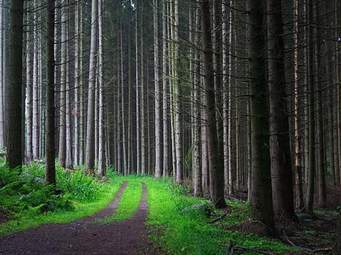 Each project should ask “what can we do better this time” and NOT in a way that implies poor performance previously, but in a way that embraces the fast pace of innovation, the changes in circumstances such as funding and resources, and the full length of the path that will get us to our greener goals. What we need to remember is the learning process is justly messy as well as an invaluable part of the process of continual improvement and periodic innovation. 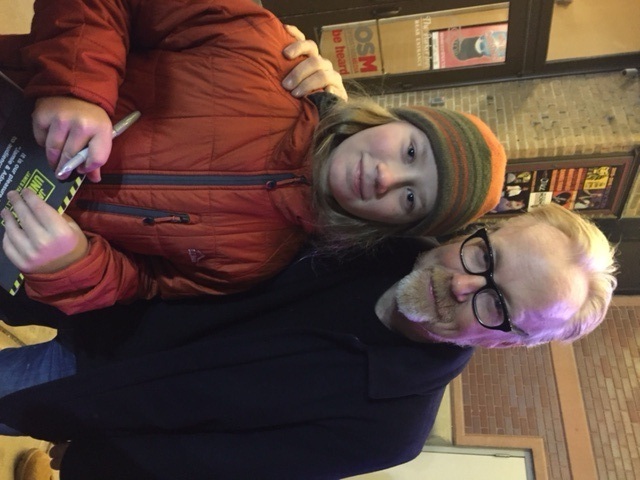 Adam Savage and my son, post show.